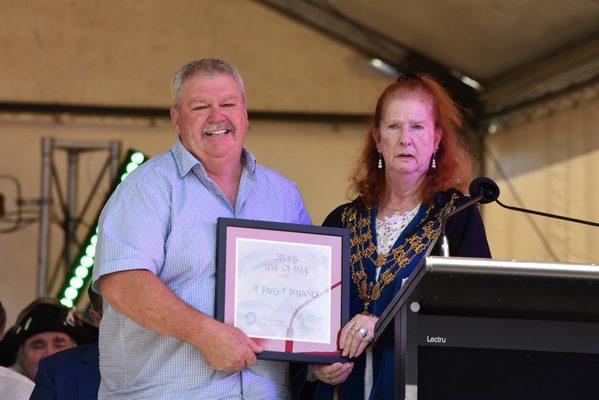 There was never any doubt as to Craig Ortland’s standing in the local sporting community and that notion was re-affirmed last Saturday when the Noble Park stalwart was awarded Sports Hall of Fame honours at the Greater Dandenong Council’s Australia Day awards. Ortland, who has been involved with the Noble Park Cricket Club for over 40 years (including 22 years as President), was speechless when he found out of his award. “I couldn’t believe it, I was gobsmacked and speechless to be honest, which was one of the few times that that’s ever happened,” Ortland said with a laugh. “It was great recognition, but it’s also embarrassing in a lot of ways. Ortland is one of the most recognised faces around the Noble Park Cricket Club and Club Noble – his work within both organisations has been tireless and after 22 years as President of the cricket club, he keeps putting his hand up for roles because of the enjoyment and giving back to the community. “I just love it,” he said of his role as President of the Noble Park Cricket Club. “I don’t play anymore, and it gives me a sense of involvement and I’m also a Director of Club Noble, which is the over-arching body for all affiliated clubs, so it gives me something to do. “There’s a whole group of us that do it and we’ve got committee members that have been there a long time as well and we all do it together. Ortland’s junior cricketing journey began with Noble Park when he was just 10 years old, as he recounts. “I played two years of under 12s, then started playing under 14s and under 16s and we won the flag in the under 16s with a really good side. Noble Park play in the VSDCA (Victorian Sub-District Cricket Association) and Ortland spoke about the club always wanting to compete in the highest level of competition possible. “I enjoy watching the firsts, it’s good to watch the good players – they’re a lot better than I was,” he said with a laugh. “As a club, we’ve always tried to aspire to play the highest level of cricket that we can. One of Ortland’s most cherished roles is being a Chairperson for the Club Noble Christmas Party – a charitable event that gives local children and families a special community day. The event has been running for over 30 years and on the last Sunday in November, over 3000 people come together as a community to enjoy the festivities and put a smile on the faces of those in need. “It’s great to see the smiles on the kids faces and it’s a great for the community.” He said. Whilst Ortland has put in countless hours for both the Noble Park Cricket and Club Noble, he made it clear that it’s a team effort and thanked everyone who has been involved in his journey. “I’ve had a lot of support along the way from my wife, four children and my Mum as well,” he said. “There’s a lot of people who do a lot of work, if not more work than I do, at all clubs, so it’s great for me to be recognised but all the volunteers of all clubs do a great job.